‘Football Hooliganism’ by English supporters travelling abroad has been the subject of considerable media and political interest since the first instances of disorder were reported in the mid-1970s. Since then, incidents of disorder and violence have occurred on a regular basis, leading to media condemnation and legislative and policing action. However, have the real causes of football violence abroad been understood and has the action taken by the UK authorities and their counterparts abroad been effective in combating the problem? This paper challenges the traditional view that football crowd disorder abroad is caused simply by travelling hooligans ‘looking for trouble’. Utilising the author’s 13-year experience of conducting observational research in the field, the paper investigates the causes behind some of the major riots involving English supporters, including Marseilles in 1998, Rome in 2000, Albufeira in 2004 and Rome in 2007. 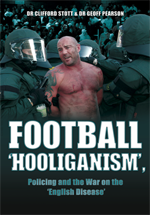 It argues that not only have the causes of the incidents been widely misunderstood, but also that many legislative and policing responses have had little impact in reducing the scale of ‘hooliganism’ (casting a particularly critical eye on the validity and effectiveness of ‘Football Banning Orders’). Finally, this paper makes recommendations as to how disorder involving English fans abroad can be reduced without damaging the rights and legitimate expectations of law-abiding football supporters. Geoff is a Lecturer in Law at the University of Liverpool Management School and Director of Studies for the MBA (Football Industries) degree. He graduated from the University of Lancaster in 1995 with an LLB (with honours) in law before completing a PhD thesis in 1999 entitled Legal Responses to Football Crowd Disorder, at the same institution.